At ArtWorks we recognize that each student is unique. In our relaxing, non-competitive environment, students feel encouraged, supported and inspired. Through individualized instruction and a customized program, we nurture and guide each student to his or her highest artistic potential. Our students inevitably succeed and emerge with confidence and pride. Since 1994, we have had the great pleasure and privilege of offering our programs to thousands of students throughout San Francisco and the surrounding Bay Area. We are entirely dedicated to helping all students tap into their artistic capabilities and to realize their artistic goals. We care deeply about our students and their experience in our program and treasure the opportunity to be mentors to aspiring artists of all ages. Anyone can learn to draw. 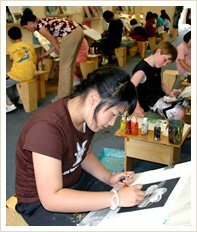 We teach the visual arts by developing the student’s ability to see relationships. Through our drawing method students learn that all forms can be broken down into simple shapes. Our step-by-step instruction enables them to use these shapes to create basic line drawings. With this technique, students learn classical principles of drawing, and gradually train both their eye and their hand. Through exposure and practice, the techniques we offer become each student’s tools. They learn to apply this approach to increasingly sophisticated subject matter, developing their ability to draw realistically. three essential elements of visual representation. Anyone can learn to paint. We provide the same careful guidance as we teach our students to paint. Through preliminary exercises students have the opportunity to become familiar with each new medium. As they progress, we use demonstrations to introduce new techniques, and we teach them how to achieve particular effects. With practice, and through exposure to a wide variety of subject matter, students gain proficiency and learn to paint with confidence. We customize each student’s program to best support his or her interests and ability. For each project, our teachers determine the level of challenge, while the student selects images that most appeal to him or her. As the student progresses, we continually adapt our instruction to meet each where he or she is. We design all projects to introduce new skills as the student is ready, and to further enrich his or her understanding.